This summer I finally got back to my bouldering roots!! Over the past several years I’ve spent a lot of time climbing sport routes, battling injuries, rehabbing those injuries, training on my wall at home in Albuquerque, and now – finally! 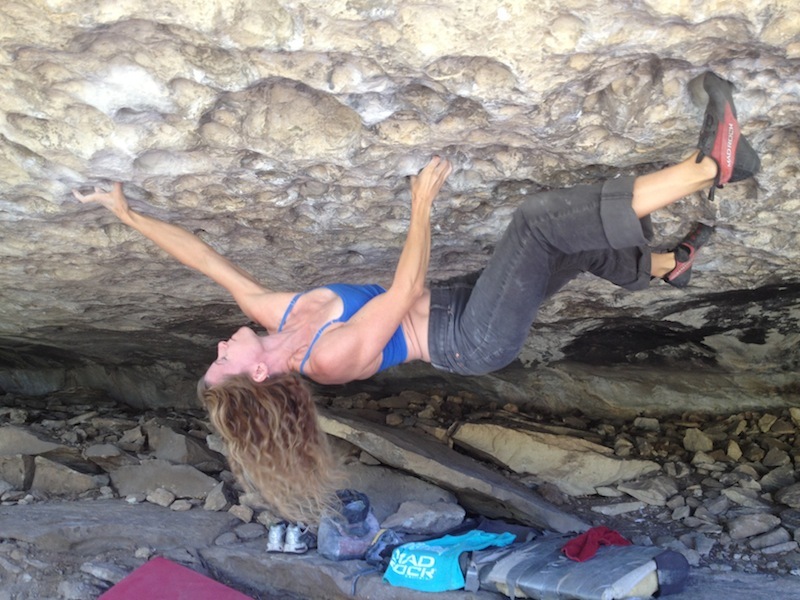 – getting back to the aspect of climbing I’ve always loved most …. bouldering. This summer my husband Timy and I spent a few weekends in Flagstaff, AZ, bouldering at Priest Draw. It was so good to be outside on steep limestone! While Flag is considerably cooler than Albuquerque, it’s still not exactly “in season” in June and July, so sending boulder problems entailed getting up at 4:30am, hitting Starbuck’s at 5:30 and the rock at 6. Not really being morning people, this wasn’t the easiest thing for us, but it yielded some good results! I spent some time struggling to sort out beta on Carnivore; it seems there are quite a few ways to get through it and it took me a few mornings to figure out what worked best for me. In the end, it was most important just to get there early enough that it was still cool outside and I didn’t feel like I was sliding all over the holds. After that, I got in my groove, felt adapted to the rock and went on to fire The Receptionist and The Girl from Ipanema. I had a blast bouldering with fellow Madrock athlete Carrie Cooper; it’s so much fun to share good energy and good beta with such a strong girl! Hope to get back out there later this month and spend a little more time together!